Talk of compromise and reductions for the proposed +$50 million school budget filled last night’s School Committee meeting. Both the school administration and the Committee searched out other routes to savings for 2014/15. As in past years during budget negotiations, Superintendent Michael Wood proposed three levels of budget cuts for consideration. The more minor cuts, in Tier 1, call for reductions such as nixing additional cafeteria seating at Nashoba Regional High School, re-negotiated terms for the bond on the high school’s athletic field renovation, and some trimming in Science and Math curriculum plans. Tier 1 cuts would total about $118,000. Tier 2 takes an additional $116,500 out of the budget, suggesting, among others, trimming the supply budgets across the elementary and middle schools, and paring the tasks that give some teachers extra, paid assignments during the summer. The additional $118,000 cuts of Tier 3 would be more severe, with suggestions such as re-arranging Related Arts classes across the district and postponing parking lot repairs. If all the cuts from the three tiers were adopted, that would pare the proposed budget by $352,000. Each tier’s cuts would reduce a district town’s potential assessment by about $35,000 from the original proposed amounts, Wood estimated. As Committee members debated possible cuts both on and off the tiered list, Committee Chair Nancy Federspiel of Bolton remarked, “It comes down to that only 20% of our budget is not salary-related—we only have so much wriggle room.” She also cautioned that the Committee will need to vote on a final budget at its March 11 meeting in order to get the final numbers into Town Meeting warrants. 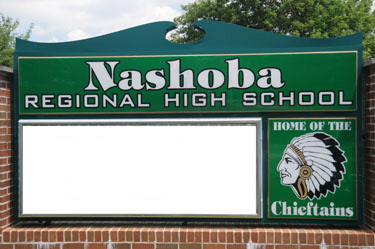 Meanwhile, Nashoba also is aiming to capture more state aid for its planned capital projects. With a unanimous vote, the Committee approved the submission of statements of interest to the MA School Building Authority for funds available for capital repairs. Wood explained that any funds would go toward expenses planned for NRHS roof repairs, as well as budgeted dollars to replace a boiler at Bolton’s Florence Sawyer School. Wood emphasized that the towns are not required to vote on these repairs, given their estimated costs already appear in the proposed Nashoba and Town of Bolton (for FSS) budgets. While Wood said the items are included in the 2014/15 budget, he did not have an offhand estimate of exactly what each would cost. If approved, the MSBA grant would reduce the budgeted amounts by the grant amount, he added. The Committee also voted unanimously to approve a letter Wood will submit to MA State Senator Jennifer Flanagan supporting a joint resolution in the state legislature that urges both houses to set their education budgets by March 15. As Wood explained, the resolution asks for the legislature to commit to its Chapter 70 funding for Fiscal Year 2015, along with its required education contributions by districts, in time for cities and towns to set accurate budgets in the spring. In the past, the legislature usually has not finalized these numbers until early summer, making budget planning tough for school districts, he said. The Policy Subcommittee announced it was not recommending the Committee re-visit its school choice policy and protocol this year, which it has the option of doing annually. Last year, the protocol was revised after often-heated Committee discussions, with complaints that the former protocol was helping to crowd some classrooms and schools with extra students from outside Nashoba. The policy dictates how many out-of-district students can be admitted to each Nashoba school and grade each year. These students’ districts pay Nashoba $5,000 per student every year. However, Stow Rep. Lynn Colletti questioned whether the protocol should be reviewed again. “At the high school, we keep struggling with capacity. Is it worth it when we don’t have enough space as it is?” Though the School Committee stuck with the Policy Subcommittee’s decision to let the protocol stand, it agreed that it should look into doing a detailed cost/benefit analysis of school choice.